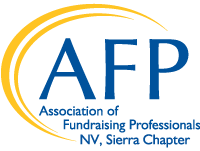 The AFP - Sierra Chapter will be offering our monthly educational meetings in the afternoon rather than at lunch. Our meetings are open to both AFP members and non-members. Meetings will continue to be on the third Wednesday of the month. New prices are $18 for members and $28 for non-members. The afternoon meetings will be held from 3:30 p.m. to 5:00 pm. Our new meeting location is at Famous Dave's Bar-B-Que located at 4925 Kietzke Lane, in Reno. A variety of tasty appetizers are included in the price. You'll enjoy nachos, rib tips, salad, chips and a taco bar with pulled pork and catfish options, along with a soda or tea. You must register for each meeting no later than 5 p.m. the Friday before meeting date. Click on the particular meeting date below for more information and to register. If you register for the meeting and then can not attend, please notify the Sierra Chapter Administrator, Sherry Griffin Grundy, by calling (775) 220-3993 or via email to afpsierrachapter@gmail.com. Your cancellation notice must be received prior to 12:00 p.m. the day of the meeting on Wednesday. If a cancellation is not received you will be billed for the meeting. An invoice will be mailed to your office for payment. If you need to pay for a meeting after the event has ended click here. For more information please call our Chapter Administrator, Sherry Griffin Grundy at (775) 220-3993.